I really do feel like sometimes I blink and my weekend is gone. Do you ever feel like that? I had zero plans as of 6:30 pm (when I left work on Friday) but don’t fret I found some. Something to know about me is I dislike loathe doing nothing most of the time. I start my weekend saying. “I’m just going to relax this weekend and not do anything.” Then around 8 or 9 on Friday I am itching to do something. This weekend was no different. It involved Bad Grandpa, Common Market (running into old flames), hair appointment, getting my friends ready for Halloween, house party, All American Pub, some DVR, Disc Golf and Hocus Pocus (SJP pre Carrie Bradshaw). I am not one to turn down a movie invitation so after a failed first attempt to see Bad Grandpa, we finally found a theater with enough seats and I laughed a lot. Now Johnny Knoxville isn’t always my cup of tea but the kid in this movie MAKES it for me. It was seriously funny and worth a watch (maybe RedBox style). After movies we headed to Common Market, which is a local place, within walking distance from my apt and where I constantly run into this guy I have ZERO desire to see. You are probably asking “Well then why do you?”. Well I go because I refuse to stop just because of him, enter stubbornness at it’s best. It was a fun night with great friends. Saturday started off with brunch and then getting my hair done. The last time I stepped into a hair salon was February….YIKES! After hair I got two of my friends, Devon and Jen, ready for Halloween. 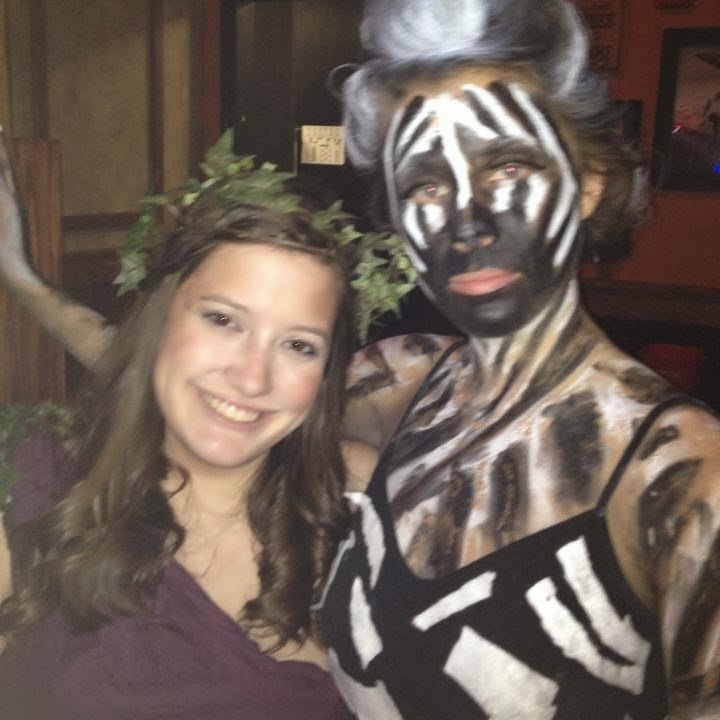 Devon was a zebra and her costume was UH-Mazing! 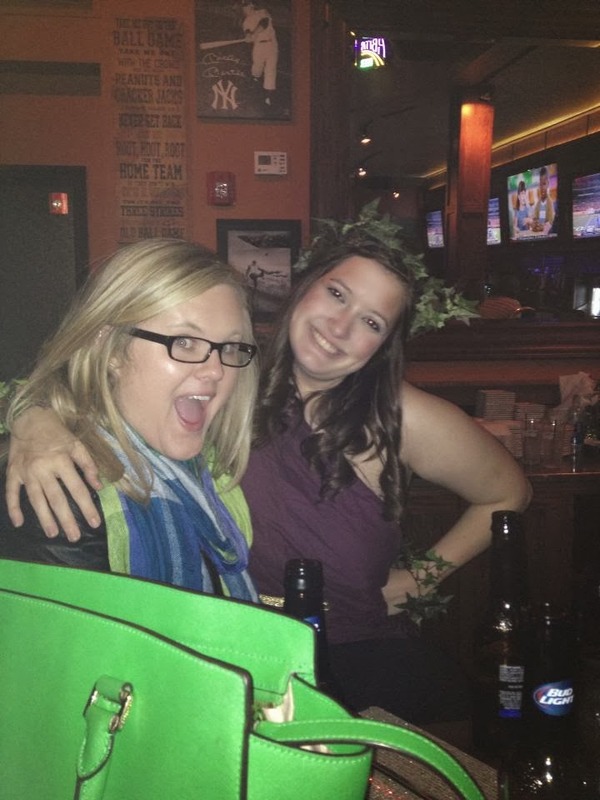 Jen was a Greek goddess and she looked gorgeous! Proof in the picture below. This is apparently the only face I know how to make in pictures these days…geez! Sunday I watched lots of DVR, played disc golf (horribly) with Lynae and Thomas and spent the rest of it making dinner and watching First Daughter and Hocus Pocus. I always forget SJP is in it and she always takes me by surprise…pre Carrie Bradshaw days! This entry was posted in friends, Life, weekend on October 28, 2013 by SimpleeSampson.